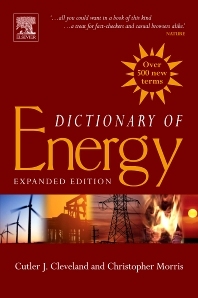 Written by the editor of The Encyclopedia of Energy, Cutler Cleveland, Dictionary of Energy gives professionals across the multi-disciplinary field of energy a tool to better communicate on energy matters and understand energy issues and opportunities. This paperback edition, priced at less than half the price of the hardcover edition and expanded with over 500 new terms, makes this valuable reference available to an even wider audience beyond energy scientists, including new professionals, students, and corporate oil and gas companies. Energy scientists, researchers from economics, engineering, and environmental science, non-energy researchers, policy advisors, new professionals, students, the general public, libraries, non-government organizations, and corporations.